This butterfly is beloved across the Globe. Vanessa Cardui enjoying a brief break from the work of gathering nectar from this hybridized Joe Pye Weed in the Butterfly Perennial Garden at Eastern Neck National Wildlife Refuge, Maryland. A good candidate for folks who are beginning a serious campaign to photograph butterflies, because when Painted Ladies nectar, they tolerate a close approach, and they can be depended upon to remain motionless and nicely posed for brief, but long-enough intervals. When not feeding, they are almost unapproachable, playing it seems, the I fly 10 feet away, let’s do that again game. 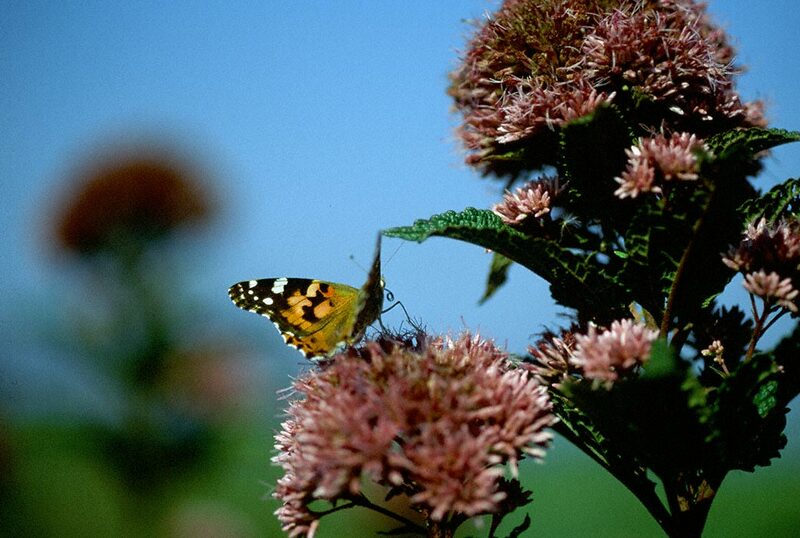 Both this Vanessa and Vanessa Atalanta (Red Admirals) are well known and good friends to devoted gardeners. When tedium almost begins to set in, suddenly a Vanessa appears as if out of nowhere. They usually remain long enough to lighten your mood. Then these spreaders of cheer fly off to titillate yet another gardener toiling in soil, somewhere nearby. Nice tribute to the Painted Lady, and Red Admiral as well!